Macworld update: Apple today introduced iPhone, a new device that combines a state-of-the-art mobile phone, a widescreen iPod with touch controls, and an Internet communications device with desktop-class email, web browsing, searching and maps‚Äîinto one small and lightweight handheld device. iPhone introduces an entirely new user interface based on a large multi-touch display and pioneering new software, letting users control iPhone with just their fingers. According to Apple, iPhone also ushers in an era of software power and sophistication never before seen in a mobile device, which completely redefines what users can do on their mobile phones. The iPhone features WiFi support and integration with iTunes, which could make it the ultimate device for enjoying audio and video podcasts. iPhone lets users make calls by simply pointing at a name or number. iPhone syncs your contacts from your PC, Mac or Internet service such as Yahoo!, so that you always have your full list of up-to-date contacts with you. In addition, you can easily construct a favorites list for your most frequently made calls, and easily merge calls together to create conference calls. iPhone‚Äôs Visual Voicemail, an industry first, lets users look at a listing of their voicemails, decide which messages to listen to, then go directly to those messages without listening to the prior messages. Just like email, iPhone‚Äôs Visual Voicemail enables users to immediately randomly access those messages that interest them most. iPhone includes an SMS application with a full QWERTY soft keyboard to easily send and receive SMS messages in multiple sessions. When users need to type, iPhone presents them with a touch keyboard which is predictive to prevent and correct mistakes, making it easier and more efficient to use than the small plastic keyboards on many smartphones. iPhone also includes a calendar application that allows calendars to be automatically synced with your PC or Mac. iPhone features a 2 megapixel camera and a photo management application that is far beyond anything on a phone today. Users can browse their photo library, which can be easily synced from their PC or Mac. iPhone is a quad-band GSM phone which also features EDGE and Wi-Fi wireless technologies for data networking. Apple has chosen Cingular, the best and most popular carrier in the US with over 58 million subscribers, to be Apple‚Äôs exclusive carrier partner for iPhone in the US. iPhone is a widescreen iPod with touch controls that lets users ‚Äútouch‚Äù their music by easily scrolling through entire lists of songs, artists, albums and playlists with just a flick of a finger. Album artwork is presented on iPhone‚Äôs large and vibrant display. iPhone also features Cover Flow, Apple‚Äôs way to browse your music library by album cover artwork, for the first time on an iPod. When navigating your music library on iPhone, you are automatically switched into Cover Flow by simply rotating iPhone into its landscape position. iPhone‚Äôs 3.5-inch widescreen display lets users watch TV shows and movies on a pocketable device, with touch controls for play-pause, chapter forward-backward and volume. iPhone plays the same videos purchased from the online iTunes Store. iPhone lets users enjoy all their iPod content, including music, audiobooks, audio podcasts, video podcasts, music videos, television shows and movies. iPhone syncs content from a user‚Äôs iTunes library on their PC or Mac, and can play any music or video content they have purchased from the online iTunes store. Yahoo! Mail, the world‚Äôs largest email service with over 250 million users, is offering a new free ‚Äúpush‚Äù IMAP email service to all iPhone users that automatically pushes new email to a user‚Äôs iPhone, and can be set up by simply entering your Yahoo! name and password. iPhone will also work with most industry standard IMAP and POP based email services, such as Microsoft Exchange, Apple .Mac Mail, AOL Mail, Google Gmail and most ISP mail services. iPhone also features the most advanced and fun-to-use web browser on a portable device with a version of its award-winning Safari‚Ñ¢ web browser for iPhone. Users can see any web page the way it was designed to be seen, and then easily zoom in to expand any section by simply tapping on iPhone‚Äôs multi-touch display with their finger. Users can surf the web from just about anywhere over Wi-Fi or EDGE, and can automatically sync their bookmarks from their PC or Mac. iPhone‚Äôs Safari web browser also includes built-in Google Search and Yahoo! Search so users can instantly search for information on their iPhone just like they do on their computer. iPhone also includes Google Maps, featuring Google‚Äôs groundbreaking maps service and iPhone‚Äôs amazing maps application, offering the best maps experience by far on any pocket device. Users can view maps, satellite images, traffic information and get directions, all from iPhone‚Äôs remarkable and easy-to-use touch interface. iPhone employs advanced built-in sensors‚Äîan accelerometer, a proximity sensor and an ambient light sensor‚Äîthat automatically enhance the user experience and extend battery life. iPhone‚Äôs built-in accelerometer detects when the user has rotated the device from portrait to landscape, then automatically changes the contents of the display accordingly, with users immediately seeing the entire width of a web page, or a photo in its proper landscape aspect ratio. iPhone‚Äôs built-in proximity sensor detects when you lift iPhone to your ear and immediately turns off the display to save power and prevent inadvertent touches until iPhone is moved away. iPhone‚Äôs built-in ambient light sensor automatically adjusts the display‚Äôs brightness to the appropriate level for the current ambient light, thereby enhancing the user experience and saving power at the same time. iPhone will be available in the US in June 2007, Europe in late 2007, and Asia in 2008, in a 4GB model for $499 (US) and an 8GB model for $599 (US), and will work with either a PC or Mac. iPhone will be sold in the US through Apple‚Äôs retail and online stores, and through Cingular‚Äôs retail and online stores. Several iPhone accessories will also be available in June, including Apple‚Äôs new remarkably compact Bluetooth headset. iPhone requires a Mac with a USB 2.0 port, Mac OS¬Æ X v10.4.8 or later and iTunes 7; or a Windows PC with a USB 2.0 port and Windows 2000 (Service Pack 4), Windows XP Home or Professional (Service Pack 2). Internet access is required and a broadband connection is recommended. 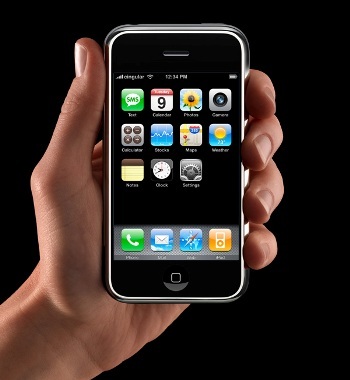 Apple and Cingular will announce service plans for iPhone before it begins shipping in June. Engadget has great blog coverage of the iPhone introduction. What I understood in a first moment, but is not clear from the presentation, is if the iPhone will be able to download directly multimedia content from the iTunes store and from RSS feeds using wi-fi or EDGE. That would be an important milestone for podcasting, giving our listeners freedom from the computer and from wired internet connection, and a great step forward toward the convergence of podcasting and traditional radio as a mean to access multimedia content. That is too bad the ability to buy content from the iPhone directly isn’t there. Does anyone know if the iPhone has a plug-in like iPods do, so the iPhone could work with other iPod accessories (like the iPod speakers, etc)?